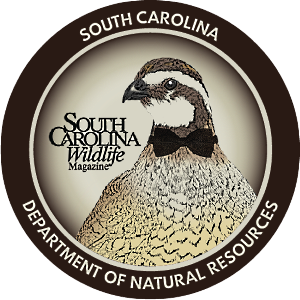 As the faint candle of a January morning lights stands of waterlogged timber and flooded fields across South Carolina, hunters on DNR's managed properties enjoy the handiwork of the agency's waterfowl area managers. Many years ago, perhaps twenty, my son Mike and I were drawn for a Bear Island duck hunt and boldly charged into the marsh on the appointed day, knowing nothing of ducks or duck hunting. My memories of this day are as vivid as if the hunt were yesterday. I remember petting Bear Island Manager Ross Catterton's Boykin and realizing he'd recently rolled in something luxuriously dead. The dog, not Catterton. I remember as the sun rose gloriously, the sky filled with ducks tracing random patterns through the gold-rimmed clouds. We shot our limits that day, for the first time ever, wigeons all, and Catterton smiled and told us we'd done good. A drake wigeon from that hunt, a gift from Mike, glides along the east wall of my office as I write this. It is providing memories like these that motivates the dedicated stewards of the land about whom you will read in this manuscript. Their aim, their main focus, is to provide safe, rewarding waterfowling experiences for the men and women, and their children, who visit these sites. They do a darn good job of it, too. Many are trained game biologists with the postgraduate degrees to prove it, but their jobs require they be much more. On alternate days they fulfill the roles of engineer, farmer, forester, electrician, plumber, equipment operator, botanist and duck guide. They get dirty at work, and they love it. Bill Mace and Ross Catterton are perfect examples. The Santee Coastal Reserve WMA comprises 24,000 spectacular acres in the coastal plain of Charleston and Georgetown counties, of which 17,000 are rice fields. 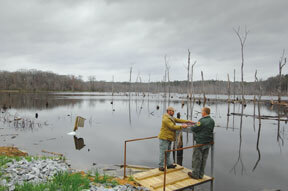 Bill Mace and his staff maintain more than fifty water-control structures and forty-five miles of dikes. Yes, forty-five miles. He has worked on this property for thirty years, as manager the past twenty-eight. Catterton, another example of enduring focus, is manager of the Bear Island WMA in Colleton County, has worked there for twenty-seven years, and is wholly committed to the stewardship of his 7,500-acre obsession. Both of these men deal with issues unique to a coastal locale, and both enjoy the fruits of the coast, as well. These are, in part, of the feathered kind . . . ducks. Having spent hours on the properties talking with them, I learned that there is one environmental factor that requires constant monitoring and manipulation, and that is salinity. Rain brings fresh water to the tidal rivers feeding the reservoirs and, of course, to the impoundments themselves, while drought increases the salinity of these rivers. When the water in the fields evaporates, the salt remains. Ducks visit an area because food is available, and they remain there because they are minimally disturbed. That food - in the form of widgeon grass, spike-rush, robustus, duck weed, foxtail millet, panic grass and smart weed - requires certain minimal salinities, specific water levels and soft or hard bottoms, as the case may be. So, the level of water in the rice fields must be controlled, and the degree of salinity monitored and influenced when necessary, which is often. Hence, miles of canals and dikes, water control structures, hours of planning and work, and reacting to weather conditions are required. This is complicated and technical work and requires the botanical and civil engineering skills mentioned above. And remember, the miles of dikes are not permanent but are eroded by wind and water, undermined by alligators (of which I saw dozens at each site) and require constant maintenance. This is where the construction skills enter the equation, because a backhoe or excavator is required to accomplish this work. The rewards, of course, are tangible as well as intangible. Black ducks, wigeons, mottled ducks, green wings, blue wings, scaup, ringnecks, buffleheads, gadwalls and pintails take refuge and sustenance in these carefully nurtured surroundings. Last season, some 500 hunters harvested nearly 1,800 ducks on these properties. Move farther from the coast and encounter a different set of conditions and challenges. Just north of I-95, on the shore of Lake Marion, lies the Hickory Top WMA, where former DNR biologist Haven Barnhill proudly showed me his Greentree Reservoir, a beautiful stand of "even-aged" oaks framed by man-made berms. 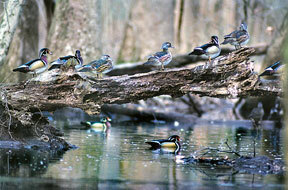 Four of every five years finds this beautiful 475-acre stand of laurel, willow, post oak and Southern red oak flooded and hosting thousands of wood ducks, plus a few big species like mallards and mottled and black ducks. The fifth year is set aside to rest the trees and the soil. 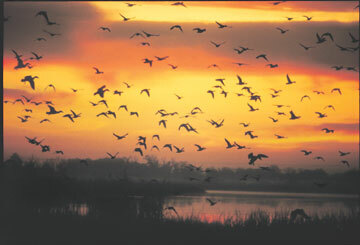 Leased from Santee Cooper, and managed in close cooperation with that agency, this is a Category II duck impoundment, meaning there is no drawing for hunters. Anyone with a valid license, migratory bird and game management permits, and state and federal duck stamps is welcome to hunt during the season on Saturday mornings until 12:00 noon. 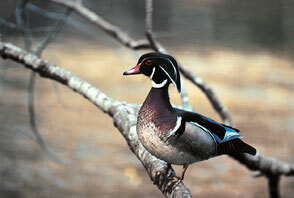 The ducks, mostly woodies, are allowed unchallenged use of the area for the remainder of the week. "Disturbance is a big issue," says Barnhill, thus the single hunting period each week. Barnhill showed me the massive pump that moves water from Lake Marion into the Greentree Reservoir. "Evapotranspiration," science-speak for the loss of moisture through the combined effects of evaporation and the drawing of water from the ground by vegetation, must be monitored to ensure that levels within the reservoir remain adequate. It is important to note that Hickory Top WMA is owned by Santee Cooper and leased by the DNR, and the two agencies work very closely with the U.S. 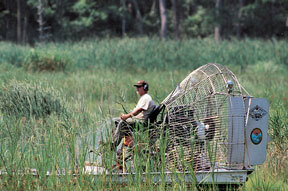 Fish and Wildlife Service, operator of the Santee National Wildlife Refuge. Move northwest a hundred miles or so and you'll find Bob Harkins hard at work at the Broad River WMA. Having worked there for thirty years and managed the facility for twenty-seven, Harkins is another example of long-term dedication, devoting his career to a large impoundment lying hard against the Broad River, 750 acres of rolling hardwoods and pines, and a Greentree reservoir fed by the starkly named Terrible Creek, to boot. "I feel like I own it," he says, "but then, I really don't own what I own." Actually, SCE&G owns the land and works closely with Harkins, giving full support to his efforts. 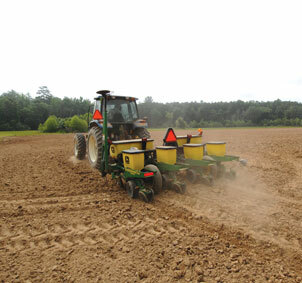 Harkins plants corn and sorghum and millet and other foods to which ducks are partial and then carefully nurtures his crops through the growing season, fretting about rain, which has been in short supply of late, and about geese, which can obliterate a good corn crop in short order. He plants his corn in dense stands without spaces (he calls open spaces landing strips) for Canadas to glide down in full honk, anticipating a hearty dose of carbohydrates. He's also learned to plant sorghum on the edges of the corn because the geese aren't comfortable in close cover and are reluctant to walk or swim through the thickly growing, heavily laden seed heads. And too much rain can be devastating as well. A few years back, after a period of torrential rain, the Broad River got ugly, flooded the impoundment too early, and stayed too long. The warm water ruined the crop. Harkins, like his counterparts on other properties, is a competent heavy equipment operator, spending hours on an excavator replenishing his dikes. He is justifiably proud of his mobility-impaired blind, a plank dock going out through the trees to the edge of the water, allowing a wheelchair-bound hunter to roll out to the action and still remain hidden in the shadows of the overhanging branches. His reward for all this? As he puts it, "Duck hunting mornings." Almost due north of Broad River WMA, nestled among the hardwood ridges of Union County, lies the Tyger River WMA, managed for the past eighteen years by Gerald Moore. Moore has recently suffered the frustrations of drought-plagued farmers everywhere. In the 2007/2008 season, his corn crop in the 12-acre impoundment was so parched it failed to make, and the duck harvest was disappointingly low. The outlook for the 2008/2009 duck season, approaching as this is written, is excellent. Moore and I toured the impoundment, now lush with standing, heavily laden corn, slogging through muddy sections already ponding from recent rains. Moore, a biologist for thirty-two years, cites cooperation with the U.S. Forest Service as key to the success of this effort. The Forest Service owns the land and the DNR manages it. A Category II Designated Waterfowl Area like Hickory Top, Tyger River welcomes any fully licensed hunter on Saturday mornings during the season. On this truly beautiful property, the impoundment lies against the Tyger River at the foot of a green, grassy ridge crested with hardwoods. Standing timber, skeletal and stark, guards one corner, a favorite place for hunters to set out their spreads and hunker in, waiting for shooting light. Such a stand of flooded timber plays a part in another in my collection of personal experiences, the story of another hunt on yet another WMA with, yes, another son. Some fifteen years ago, my son Bobby and I were drawn for Broad River, and hunted flooded timber. I tripped and performed the classic dance of the flailing dad, plunging through the skim ice like a shot swan. Bobby didn't laugh. We saw many mallards that morning, and the boy acquitted himself well while I shivered and shrunk, praying for a shaft of warming sunlight. So, for the DNR personnel the cycle continues each year from the coast to the foothills. Controlling the water, preparing the ground, planting and nurturing the crop, and finally, flooding. Then, in the dark of a Saturday morning, the hunters will arrive, and rules and regulations and the way of things will be discussed. Out to the blinds they'll go to set decoys and watch the sun fulfill its contract in the east. And I guarantee memories will be made that day.